I know that this will be hard for some of you to hear since Jake and I have had such a long and well-publicized history together but...there was someone else. Before Jake. It was low-key, and so much less volatile, but it was real. All I can hope now is that he never meets me, because he'll be crushed once he realizes what he could have had... Meanwhile, the rest of the world's male population can breathe a sigh of relief that the competition for my affections just got a little less intense. And because apparently God woke up today and thought, 'Hey! Let's make it a Becky news day!' the other big announcement of the morning is that you can now buy Beatles songs on iTunes (!). The snob in me doesn't understand why anyone who is alive right now doesn't already have a complete Beatles library, but hell, Wills is going around marrying people who aren't me so WHERE IS THE SENSE IN LIFE. 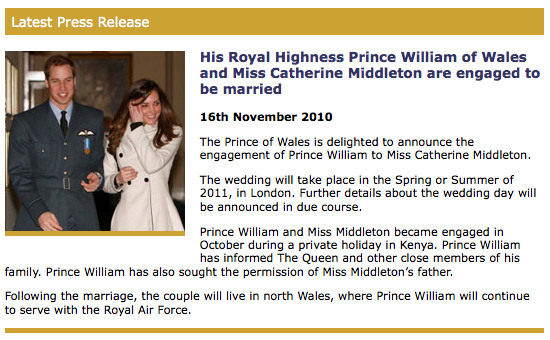 Press release from the website of William and Harry. Darling yet another crule blow delt to you! Stand tall and go get prince Harry! I think we all once dreamed about marrying Prince William but me! I somehow I have a thing for trouble boy, black sheep Prince H.
Congrats Prince William! I hope you never get to know PH. I think the bigger issue here is that some Royals have decided to get married in the same season as britpopbaby!! OH MY GOD I feel SO privilaged to be living to see something as exciting as this. And cant you beleive that ISJ is the one who brought me this news! BPB, double OMG! They should have been a little more considerate... How rude of them! Talk about stealing your thunder... You just need to make yours louder now!!! I prefer prince harry my self, but I think you dodged a bullet because isn't he starting to bald? Knowing a tiny bit about the goings on of the britpopbaby wedding, I think it's quite obvious that Wills strategically timed this to make sure he wasn't upstaged. He waits all these years and we're supposed to think it's a coincidence he starts planning the wedding NOW? Clearly no. Ah yes, the Prince William crush. I feel better knowing I am in the company of many other young, amazing, and beautiful women ;) I remember sitting on my back porch reading the issue People Magazine about Princess Diana after she was killed. Instead of grieving her loss, I stared at Will's picture for hours and could swear I felt fate recalibrating in my favor to one day become Mrs. Prince William of Wales. I feel old, too! So sorry that Prince W found some commoner to replace you PG, that is just wrong. But on the other hand, at least Prince H is still unattached for the moment. I tried to get my own Royal Mint made but it isn't happening.